In the suspenseful third season of The Americans, Philip and Elizabeth Jennings' real identities risk exposure as their worlds expand. On DVD March 1, 2016! 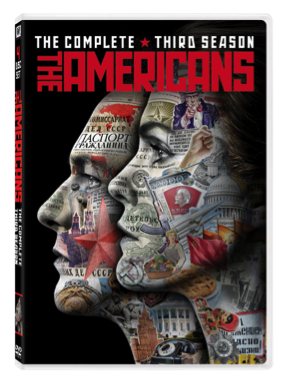 The Americans is a period drama about the complex marriage of two KGB spies posing as Americans in suburban Washington D.C. shortly after Ronald Reagan is elected President. The arranged marriage of Philip (Matthew Rhys) and Elizabeth Jennings (Keri Russell), who have two children – 14-year-old Paige (Holly Taylor) and 12-year-old Henry (Keidrich Sellati), who know nothing about their parents’ true identity – grows more passionate and genuine by the day, but is constantly tested by the escalation of the Cold War and the intimate, dangerous and darkly funny relationships they must maintain with a network of spies and informants under their control. In the nail-biting third season of The Americans, Philip and Elizabeth Jennings’ (Matthew Rhys and Keri Russell) personal and professional worlds collide like never before. Exposure of their real identities as Russian spies looms as their friendship with FBI agent Stan Beeman (Noah Emmerich) grows. Meanwhile, Stan’s past involvement with a double agent shakes up the bureau. And as the Jennings’ assignments grow riskier and more ethically questionable, they face mounting pressure to induct Paige into the KGB. With its palpable suspense, dark wit and rich portraiture of 1980s American culture, this thrilling show remains “the best ongoing drama series on television” (Tim Goodman, The Hollywood Reporter).